25% of UK’s online sales are export based. Similarly China, US, India and many other countries are capitalizing on export through E-Commerce. Pakistan has huge potential in this regard as it has some of the best local made products especially in sports, textile, handicraft and footwear. Apparently, since 2001 State Bank of Pakistan has given approval to process E-Commerce proceeding through banking channel through proper documentation perhaps, due to lack of awareness this has been not followed Here are following two documents for exporters, especially the boutique exporters who sends large volume of goods through undocumented channel. Having said that documenting exports means the exporters can avail refinance, grants and many other facilities by the local and international agencies. 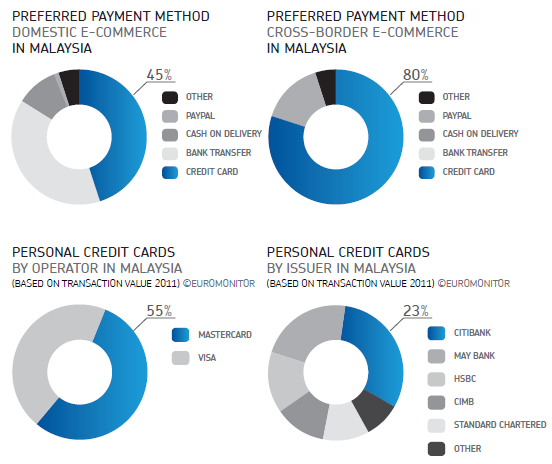 Further more as per graph show here, shoppers prefers to pay by credit card for cross border shopping as compare to Paypal which could get signup through local merchant providers like HBL, UBL and Tameer Bank. Internet Retailers must look into this while proceeding their online sales through to cross borders. The procedure is very simple. One has to submit a Form E of say $1000 and report all partial shipment till the $1000 is matched till the new Form E is again submitted. Due to undocumented economy Pakistan misses many opportunities whereby investors, third party service provider resist to invest as they dont have any clear picture of exports. In the light of above Internet Retailers may consider documented channel for their exporters which will bring high impact in the future at micro and macro level. Be the first to comment on "Export opportunity for Internet Retailer"